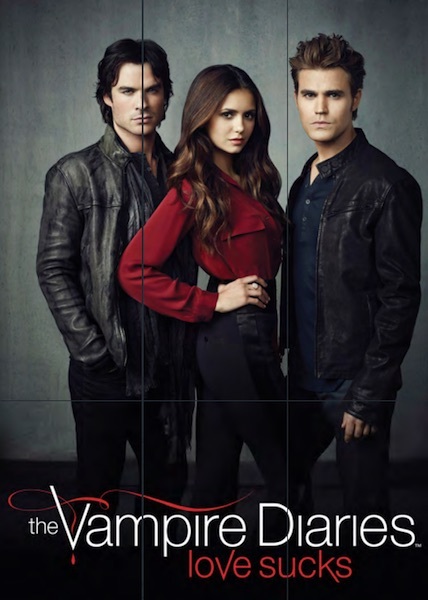 2016 Cryptozoic Vampire Diaries Season 4 looks at the ongoing struggles for Elena, Stefan and Damon. 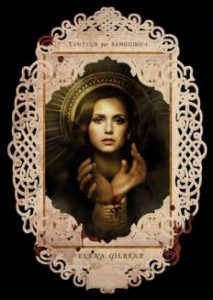 The trio headline the set with a fresh take on the popular vampire series. 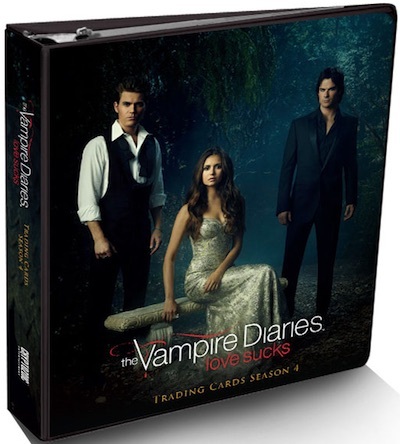 Featuring 72 cards, the base set presents an episodic approach with multiple cards for each of the 23 episodes in Season 4. 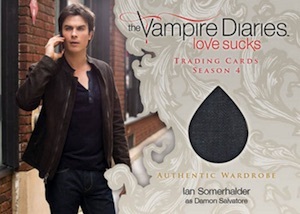 The cards include actual images from every episode and showcase all the key moments from the season. 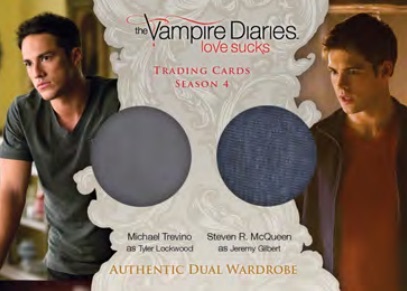 Dropping several per box, the chase inserts each average 1:3 packs. This includes Portraits, Studio and Trio. 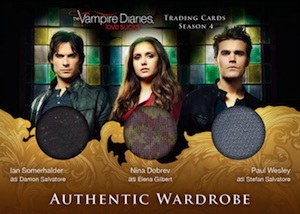 Randomly inserted, one-of-one Printing Plates are available for the base set and select inserts. 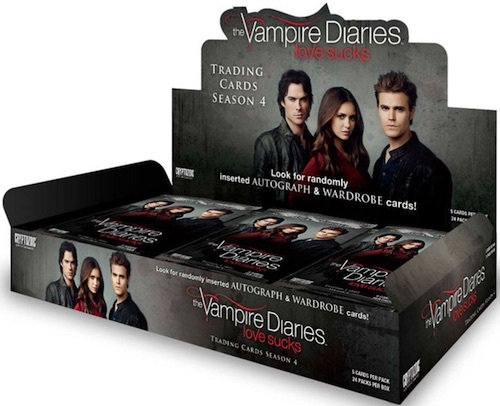 Covering main characters and guest stars, premium hits include Autographs and Wardrobe cards. Hobby boxes average one of each hit. 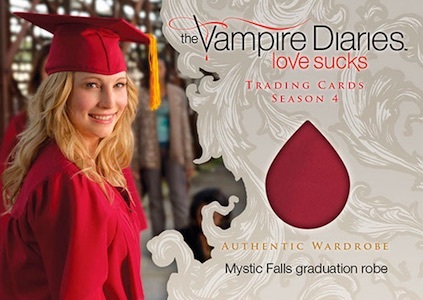 In addition to the main card product, a special album is sold separately and includes an exclusive Mystic Falls graduation robe wardrobe card. 23 cards. Overall autograph odds - 1:24 packs. 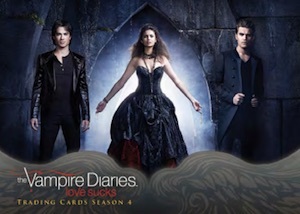 5 cards. 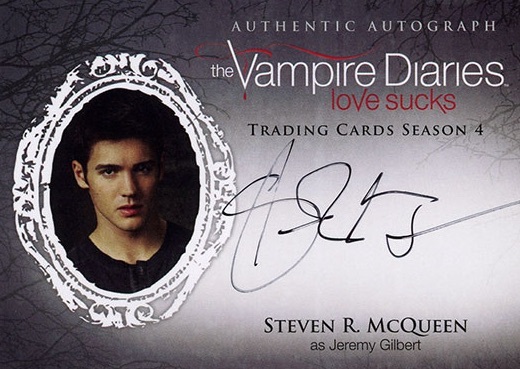 Overall Autograph odds - 1:24 packs. 18 cards. 1:24 packs. 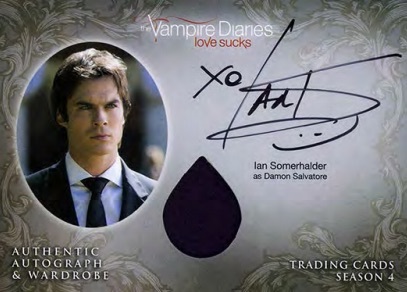 Card #24 is binder exclusive.